Ingram is a seedling of Ralls Janet which originated on the farm of Martin Ingram in Springfield, Missouri in the 1850’s. A very dependable bearer which rarely fails to produce abundant crops every year. Medium to large in size with clear, yellow skin streaked with red and crimson. Tough-skinned with firm, white, juicy flesh. Subacid in flavor. Late bloomer is protected from late spring freezes. 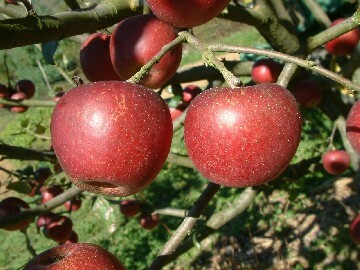 Ripens in October.